We have snow on the ground and the temperatures show no sign of rising any time soon. Though the calendar doesn’t show it, it’s officially winter. Did you mean to install new windows last spring, but find that time mysteriously slipped away? Did summer and fall fly by before your eyes? Don’t worry, you can install new windows at any time of the year, which means you don’t have to go one more winter with drafty windows, high heating bills, and a cold house. Actually, there are some benefits to installing windows in the winter vs. our warmer months. Bugs – Flies, mosquitos, and bees are all bugs that need to stay out of your house. Save money on fly swatters and keep your bug murder count down by installing windows in the winter. Allergies – Some people are so sensitive to pollen in the spring, summer, and fall that their only enjoyable time outdoors is in the winter. 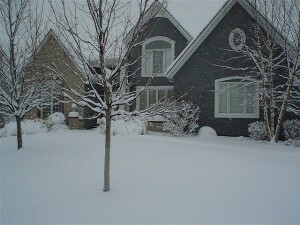 If you have a family member with severe allergies, a winter window install will keep the pollen out and the mucus in. Houdini pets – Escape artists come in all shapes and sizes. From cats to small dogs and birds, pets who want a taste of the great outdoors will look for any opening to explore what’s outside of the home. They’re less likely to attempt an escape once they get one sniff of that cold winter air! It’s on YOUR time – The best reason to install windows in the winter is the freedom to choose when the job gets done. Most people wait for optimal conditions, such as spring and summer, to replace their windows. If you choose to have your project done in the winter, your contractor won’t have to coordinate with nearly as many other projects. The Chuba Company can work with most weather conditions. As most Minnesotans know, if we wait for optimal conditions, we wouldn’t get anything done! We have 42 winters of experience installing windows. No matter what the climate, The Chuba Company offers our Quality Workmanship Warranty. Contact us today to schedule your winter window installation! Have you connected with us on Facebook? You can also follow us on Pinterest and Houzz to view our past projects!